the second meal of the day to commemorate the end of the beijing summer olympics last weekend was appropriately centered around peking duck. 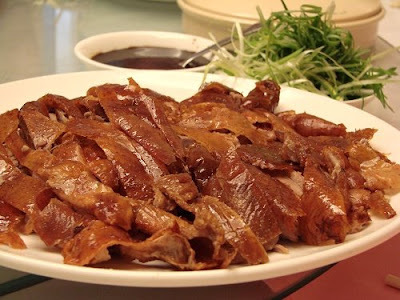 peking cuisine is well known for serving the best peking duck in town. i remember having the peking duck there on thanksgiving with my family many many years ago, but couldn't really remember thinking it was as good as people say it is. i was anxious to get back there and investigate with the houston chowhounds. dinner this evening was for 12 and we secured the private room for the event and also ordered our ducks one day in advance. my chinese mother was in tow for dinner so we could order off the chinese language menu. chinese language menu. we ordered 2 ducks and the family dinner for 6 which included your choice of 6 cold appetizers, 6 hot dishes, and 1 starch. la pi in garlic sauce. it had a strange sour taste, i was not fond of it. honey smoked fish. the consensus at the table was that the dish was not that great. it was overly fishy, dry, and had only a slightly sweet taste. fried stuffed bun. i didn't try it. 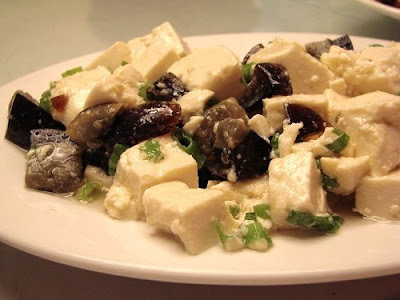 preserved egg with tofu. i only like preserved eggs (aka thousand year old eggs) in congee. it is definitely an acquired taste. i noticed that most of this dish went untouched on the table. soy sauce pork feet. truthfully, i don't remember trying this. if i did, it was not memorable. perhaps some attendees can comment about this dish. 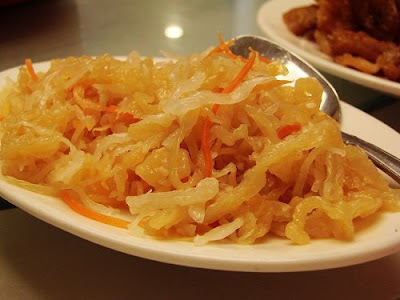 jellyfish with garlic. excellent. i could have eaten the whole plate myself. spicy beef tendon. i love tendon and this was no exception. i would have prefered cilantro on top instead of scallions to complement the heat. fish with hot red pepper. i expected the fish to be crispy which it wasn't. perhaps, i waited too long to dig into the dish. it also looks a lot spicier than it was. next time i'd rather order the sichuan fish. eggplant with garlic sauce. i love japanese eggplant and this dish didn't disappoint. 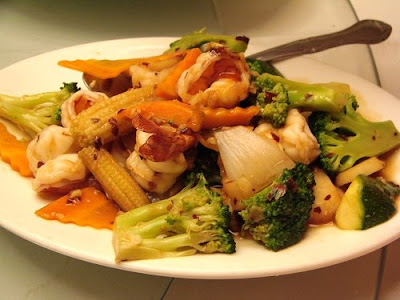 fantail shrimp (not on english menu). nothing exciting. the dish tasted exactly the way it looked. i would have liked to eat more of the veggies in the dish, but i was sharing with 11 other people. 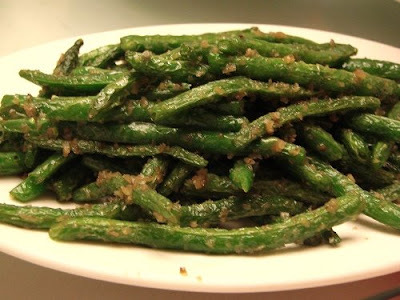 stirfried green beans. very good. 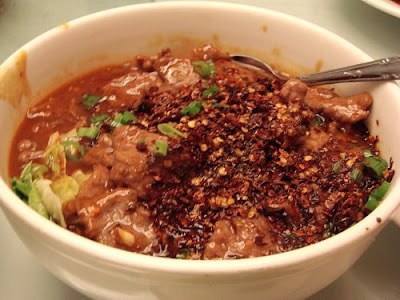 sichuan beef. good ma la from the dish, however not nearly as tasty as sichuan cuisine. ma po tofu. again, passable but not as good as sichuan cuisine. the star of the show peking duck. the duck skin was arranged on top of the plate of duck meat carved off the whole duck. scallions and plum sauce were served on the side. pancakes were served in plastic tortilla holders (pancakes are in the above photo of the whole table). the duck had cooled down too much by the time it was served and i expected the skin to be crispier. however, the pancakes were warm and delicious. definitely the best i've had. soup made from the duck carcasses, napa cabbage, and tofu was also served at the end of the meal. it's hard to believe that this is the best peking duck houston has to offer. does any place in houston actually carve peking duck at the table? the meal was fun and enjoyable of course b/c the chowhounds were there. it was also a great value as the meal came out to $13 per person. 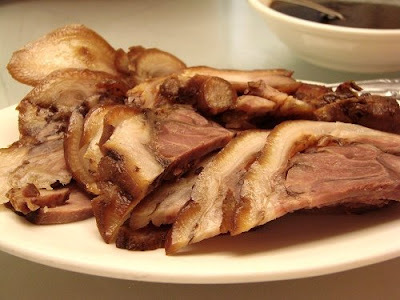 for sichuan food, i'd definitely head to sichuan cuisine, but i guess for my peking duck fix - this is as good as it gets? 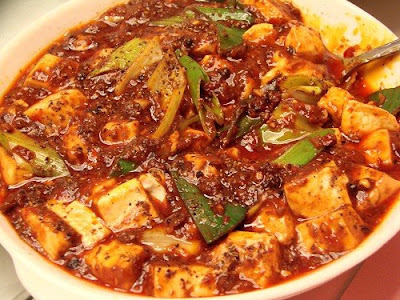 the mapo tofu looks so delish! Wow, this party food is just mouthwatering. The party seems to be very enjoyable. At Los Angeles wedding venues you can have wonderful experience of luxurious parties. I just celebrated my per-wedding party over there and really had great time.